You need to install and set up an Oracle instance, ensuring you comply with the information below. Supported for Standard and Enterprise editions. Express (XE) edition is not supported. •String attributes will hold a maximum of 1000 characters. •If you need more than 1000 characters, extended text attributes should be used. 1. If you are using archiving (enabling the Archive mode), we recommend you use two destinations for your archivelog. 2. We recommend using Automatic Shared Memory Management (ASMM configuration). 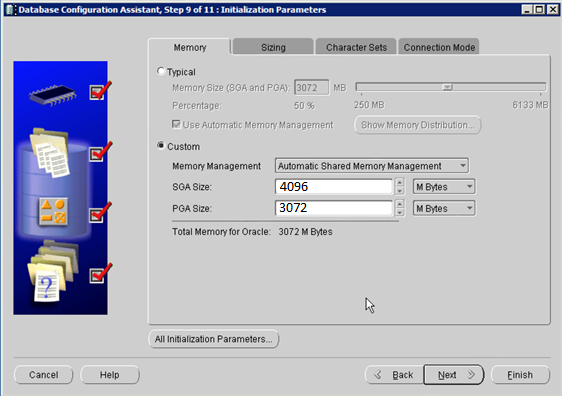 •4 Giga bytes for SGA memory. •3 Giga bytes for PGA memory. 3. We recommend assigning a block size of at least 8000 bytes, and specifying a maximum of 300 processes. 4. We recommend using 4 redo logs groups, each one of them assigned to use 3 Giga bytes. Note that the above recommendations are strictly the minimum prerequisites for your Oracle 11g instance. Further sizing considerations will depend on your project's characteristics, and a detailed analysis to determine scalability and additional demands, is recommended. When using an Oracle cluster (i.e, RAC), consider the usual recommendations as issued by Oracle, such as using a high speed network connection for Heartbeat purposes. Carry out the next steps, to make sure that your Oracle instance is set to work with Bizagi. This query should display a supported Oracle version. 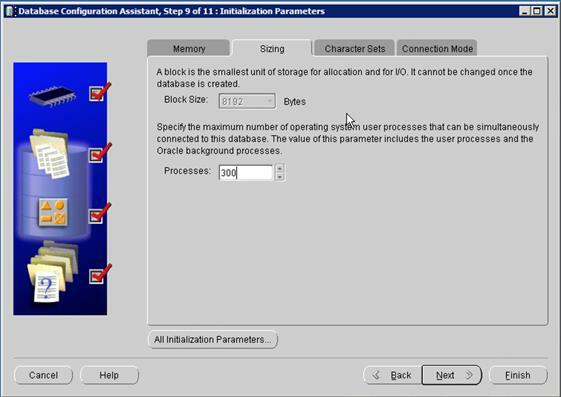 Once you are certain you have installed your Oracle instance while meeting the prerequisites, create a specific admin user for Bizagi (to initially create the database, to upgrade Bizagi's version and perform other tasks). This user is called BizagiAdmon. You need to create this user for Bizagi, in your Oracle instance by running a script. Locate the Bizagi installation path and browse into the Project model's database folder (by default at C:\Program Files\BizAgi\BizAgi Enterprise\ProjectModel\Database\). 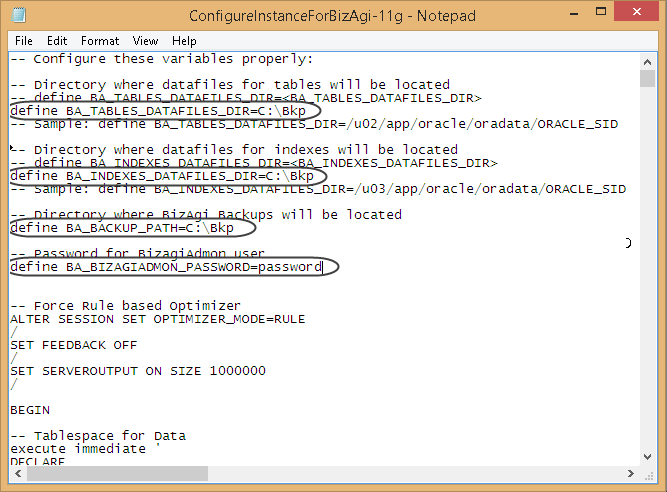 For Oracle 11g R2, edit the script called ConfigureInstanceForBizAgi-11g.sql. The script has a .basql file extension. In other to retrieve the actual script, rename this file extension to .zip and then extract its contents. •BA_TABLES_DATAFILES_DIR: Replace with the path to where you want to create the tablespaces datafiles. •BA_LOBS_DATAFILES_DIR: Replace with the path to where you want to create the datafiles holding Bizagi LOBS. •BA_INDEXES_DATAFILES_DIR: Replace with the path where you want to create the indexes datafiles. •BA_BACKUP_PATH: Replace with the path to where you want to store automatic backups. •BA_BIZAGIADMON_PASSWORD: Replace with the password for the BizagiAdmon user. Run the edited script and make sure the operation completes successfully. Use the script that corresponds exactly to your installed version of Bizagi. The following is applicable to Oracle version 12 and is a recommended guideline due to Oracle's report on BUG 21615091 (https://support.oracle.com/rs?type=bug&id=21615091).